Evergreen A-44 is an environmentally preferable and safe solution for contents cleaning. 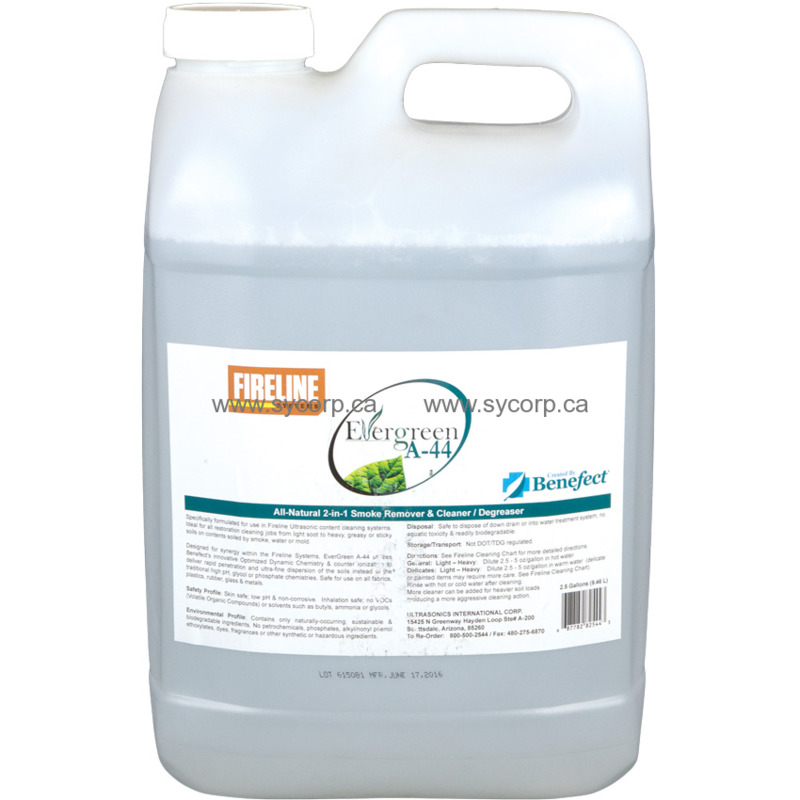 Formulated for use in ultrasonic content cleaning systems such as Fireline Systems, Evergreen A-44 is an all-natural cleaner degreaser specifically formulated to clean contents. A 2-in-1 product, Evergreen is suitable for delicate items as well as heavy grease or sticky soils. Perfect for contents damaged by smoke, water or mold. Designed for synergy in ultrasonic equipment, Evergreen A-44 utilizes Benefect’s innovative optimized dynamic chemistry & counter ionization to deliver rapid penetration and ultra-fine dispersion of the soils. The ultrasonic technology is the catalyst that makes the process extremely efficient, saving time and labor in cleaning contents. Rinse with hot or cold water after cleaning. More cleaner can be added for heavier soil loads producing a more aggressive cleaning action. Evergreen A-44 is a low pH alternative to synthetic degreaser products, making it safe to touch skin and non-corrosive. Evergreen A44 doesn’t contain any solvents or VOCs that would pose an inhalation risk in indoor environments. Made with only naturally occurring and biodegradable ingredients makes it the sustainable choice for contents cleaning.